2.1 Why are spotlights best for hunting? 2.2 Why are LEDs the best choice for hunting spotlights? 2.3 How is the brightness of a spotlight rated? 2.4 What are some other features to look for when buying spotlights for hunting? 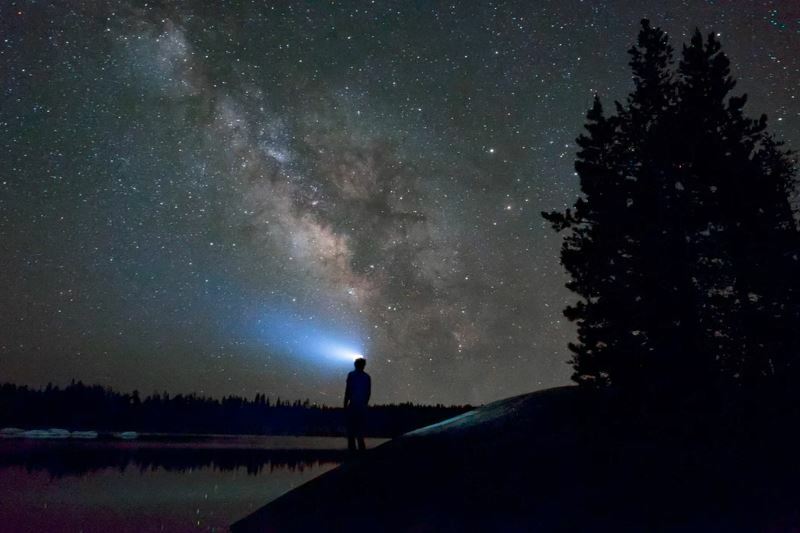 When you are out hunting or camping, a reliable spotlight is an essential piece of equipment. Many wild animals have superior senses that help them evade you in the dark. Whether you are hunting for raccoons or just trying to chase away some coyotes, the best spotlight for hunting is something you should have in your hands. For everyday illumination outside the comfort zone of our homes, we usually depend on small pocket flashlights. These EDC lights are great, but they have limited power and cannot illuminate larger areas. Handheld spotlights are bigger, are brighter, and can be used to illuminate spots across longer distances. And thanks to the advancements in miniaturization of technology, these spotlights are also getting more compact and lighter all the time. Most modern hunting spotlights are easy to hold, and many feature pistol-style grips for extra convenience. The top five spotlights we reviewed all have this grip design. Sheathed all in matte black and with an efficient pistol grip, the Larson LED light looks every bit the part of a professional hunting spotlight. At the heart of this device is a single high powered LED rated at 25 Watts. That LED is capable of dishing out over 2000 lumens of light at the press of a button. That is close to 6 million candlepower units. The LED is manufactured by Cree, who is a leading name in the field. The high level of illumination is achieved thanks to the presence of a parabolic reflector inside the flashlight. The Li-ion battery inside the spotlight is rechargeable and provides enough juice to last you for up to three hours. The overall build quality of this light is also top notch. With tough ABS construction and IP65 waterproof rating, the Larson LED can survive harsh outdoor weather conditions. 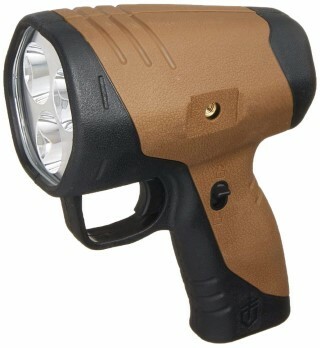 The grip has a textured nylon finish which allows you to hold this flashlight even during rains safely. During the hunt, you can focus the beam to a 30-degree spot to sharply illuminate any area. Another great feature on this spotlight is the handle design. At the base, there is an embedded nut fastener. You can use this feature to attach the spotlight to compatible surfaces, like a tripod or a magnetic base. This will all you to free your hands while still providing steady illumination at night. Overall, the pistol style spotlight from Larson Electronics surprised us with its excellent performance and durability in the field. While many other spotlights settle for smaller 10W LEDs, the guys at Larson seems to have taken a “go big or go home” kind of approach. And we think that they have succeeded in creating a winner here. 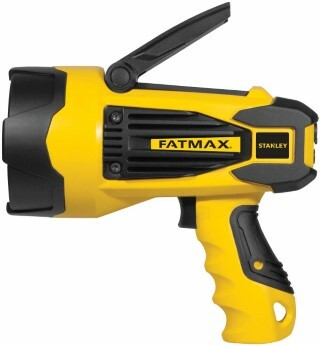 If you find the bright yellow and black color scheme on the FATMAX spotlight slightly familiar, don’t be confused. This product is from the same company who owns the Black+Decker range of tools. The Stanley FATMAX is a powerful all-purpose LED spotlight with several neat features under its hood. The pistol style here is neatly executed, with the power button resembling the shape of a trigger. The contoured and patterned handle feels very comfortable in your hands. As for the actual light itself, it houses a 10W LED, capable of a maximum output of 2000 lumens on the high setting. But at that setting, the in-built Li-ion battery will discharge completely after one hour of constant use. But thanks to the inclusion lower beam settings, this spotlight will last much longer than the Larson Electricals LED on a single charge. In fact, with low and infrequent use, the battery can hold the charge for over one year! If you use the spotlight in the lower 700 lumens setting, you will get 7 hours of use before having to recharge.There is an option for a pivoting stand. You can mount this on a tripod to get some hands free use. But the neat feature here is the trigger lock. You see, the flashlight does not use an on-off feature. Instead, it has a more flexible trigger function. Thanks to the trigger lock, you can place the LED spotlight on a mount and get continuous illumination. Build quality is quite good, with decent fit and finish levels across the sturdy plastic body. The spotlight is not waterproof, but it is still rated as water resistant. If you are dealing with some light showers while on the hunt, this Stanley light should be able to survive without any issues. In appearance, the SL10LEDS is almost identical to the FATMAX LEDLIS. The difference here is the power output of this spotlight. It is weaker than the LEDLIS, with a peak output of around 920 lumens on offer in the high beam setting. If you want a hunting spotlight on a budget, the SL10LEDS is an excellent option. The handling is convenient, thanks to the reliable pistol grip design. This variant gets most of the positive features available on the other FATMAX spotlight. It uses USB charging, and can even be charged inside your car. This is a fantastic feature for hunters who often do not have ready access to wall charging outlets out in the woods. The battery life is excellent, with up to 7 hours of run-time on offer. The Li-ion battery can hold the charge for 12 months. This FATMAX spotlight also uses a 10W LED as the light source. There are two beam settings, high and low. On top of the light, there is a pivoting stand which allows you to place this light anywhere for hands-free use. Build quality is quite good, and the heavy duty bezel is quite impressive. This is a light designed to withstand rough use. It is water resistant, and can effectively survive wet conditions. But as there is no waterproofing, you cannot allow this light to get submerged. The three other spotlights we have reviewed so far are general purpose products which can do well in the woods. But the Gerber Myth is a different beast altogether. It is built specifically for hunters, and it shows even in its appearance. It has a distinctive design, with a black and brown color scheme.The handle on this pistol style spotlight is wide and comfortable to grip. There are several mount options on the Gerber Myth. You can clip it to your belt, or mount it on a tripod or boat. It uses an advanced UNC mount on this spotlight. The LED on the Myth is capable of delivering 600 lumens of maximum illumination. That is at the high brightness setting. The device also has a low beam, which throws 100 lumens of light for basic illumination. With the Li-ion batteries, you can get around 8 hours of max runtime on low brightness settings and around 3 hours on high beam. The Myth was designed with hunting in mind, and it shows. They have provided two color filters along with this spotlight. Depending on the species of animal you are hunting, you can opt for the red or green filter. The light has both a flexible pull trigger controls, as well as an always-on button. The light has a very durable exterior, and it is designed to be waterproof as well. So you can safely use this flashlight in wet and muddy conditions. The High Noon is a very tough looking spotlight from Browning. 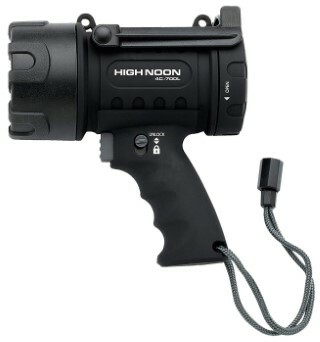 The all black spotlight has a pistol grip design, like the other products in this list. The single LED unit inside is capable of delivering 1000 lumens of light in the high beam setting. We really liked the low beam setting on the High Noon 4c. At 90 lumens, it is bright enough to deliver close illumination, and also saves a lot of battery runtime in the process. The spotlight is very compact and lightweight as well. It is easy to hold, thanks to a contoured handle. It uses a handgun style trigger mechanism, with a lock button to keep the light in “always on” mode. This spotlight has capability to float on water, so it is a great option for hunters. If you hunt near lakes or creeks, this is one of the best spotlights for you. It is durable enough to survive the odd fall into water or mud. The batteries are quite long lasting and can be charged either using a wall outlet or car charger. Though there is no option to adjust the beam intensity, the spotlight is intense enough to illuminate the surroundings at night. You can illuminate spots hundreds of yards away with this spotlight. If you want a durable yet affordable spotlight for hunting, the Browning High Noon offers phenomenal value for money. Why are spotlights best for hunting? If you want to light up spot hundreds of yards away at night, a pocket flashlight is often not enough. In large fields and properties, you need a larger, more powerful source of light. Spotlights offer a mix of portability and powerful illumination in a handy package. 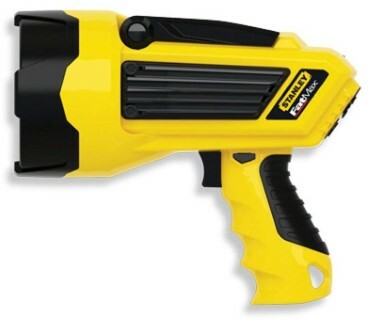 They are like larger variants of flashlights. In the past, they were quite bulky contraptions with heavy batteries and even heavier light bulbs. But modern technology has carved away a lot of that excess fat, creating trim, lightweight spotlights with advanced LEDs that offer a superior blend of performance and longevity. Why are LEDs the best choice for hunting spotlights? Light Emitting Diodes, or LEDs, are not a new invention. They have been around since at least the 1970s. But in the past, they were costly to manufacture and were only used in high-end devices and research equipment. But with the advent of modern technology, LEDs are being mass manufactured. As a result, the lighting industry has seen a revolution in recent years. Old bulbs use different forms of incandescent filament designs. They are capable of creating very bright light but at significant cost. These bulbs use up a lot of power and are very inefficient. Spotlights using these bulbs tend to be bulky due to the need for heavier batteries. They also generate a lot of heat and are not very durable. LEDs are superior to incandescent bulbs due to their superior energy efficiency. HID lamps and Halogen bulbs may generate more light, but their extra bulk and inefficient design make them relatively weak. And LED technology is still evolving at a fast pace. You can easily find new LED spotlights capable of delivering hundreds of lumens. Understanding the brightness rating of a flashlight or spotlight can be confusing. In science, there are several different measurement systems for light brightness and intensity, among other things. You may come across several different terms, which can get confusing, especially if you want to compare the brightness of two different products. Candlepower/candela: this is an outdated unit of illumination that measures the light at the source. Lumens: this is a more modern and standardized unit of measurement of light that looks at the total output of light in all directions, not just at the source. It is weighted according to the sensitivity of our eyesight. Most modern flashlights use lumen rating to describe their light capacity. Comparing a flashlight or spotlight rated in lumens with one rated with candlepower/candela is difficult. If all else fails, you just have to turn them both on and figure out for yourself! What are some other features to look for when buying spotlights for hunting? This is a common feature for flashlights, headlamps, and spotlights. It describes the maximum distance the beam of light from a spotlight can reach and illuminate. Modern LED spotlights can throw a bright beam of light across hundreds of yards. Typically, anywhere from 100-300 yards can be considered a decent average. Gone are the days of portable lights that used throw away batteries. This is the age of rechargeable Li-ion cells. Run time is the number of hours a flashlight can deliver the same output of light before it drops to ten percent of the initial output. Some flashlights slowly reduce the light, while others stay constant and then suddenly grow dim. High capacity batteries will obviously deliver longer run times, but on the downside, they will weight the spotlight down. The run time is also determined by the brightness setting used. With high setting, most spotlights deliver between 1-3 hours of run time, while low beam run times can be anywhere from 7-14 hours or longer. This is a very important feature for a hunting spotlight. Any electrical device designed for outdoor use must have an IPX rating. The best hunting spotlights are 100% waterproof and can survive going underwater. But the majority of models come with a basic water resistance rating, which allows them to survive some exposure to water. LED spotlights come with specially designed reflectors. Many of them offer an option to switch between flood beam and spot beam. Flood beam is ideal for general purpose illumination of a wider area. The spot beam is better for quick spotting of prey, or specific routes when walking/chasing at night. It is always better to look for spotlights with at least two different modes: a high and low mode. Those that lack this basic feature tend to be one trick ponies: you cannot increase their runtimes at all. If you want to conserve power, you will have to switch them off. But in the case of spotlights with a low beam, you can increase the runtime and still get basic illumination. In emergency situations, this can be a lifesaver. The best option for durability is often a metallic casing, usually made of aluminum. But most affordable hunting spotlight manufacturers opt for high-density plastics to keep the weight and costs down.